The 1940s and 1950s were the apex of the glamorous era in Hollywood, a time before Instagram and Twitter when the private lives of movie stars were more or less private. Rarely did the general public get to glimpse inside their well-appointed homes, only guessing at what lay behind the striking facades. It was the heyday of California-based architect John Elgin Woolf, who designed homes for the Hollywood elite, developing a style that would come to be known as Hollywood Regency. His client list included the likes of Cary Grant, Errol Flynn, Katharine Hepburn and Spencer Tracy, Vincente Minnelli and Judy Garland … the list goes on. Woolf’s style, both elegant and theatrical, captivated design fan Valerie Genereux, who came across the Woolf sketch known as “Daydream House” one day and was instantly hooked. And though Daydream House was never built, Valerie and her husband, Yves, were determined to make the iconic house the inspiration for their own dream home on the banks of the Rideau River. In 2011, the couple called up designer Andre Godin of Andre Godin Design and set the wheels in motion. “The architect’s painting of the exterior formed the concept,” explains Godin. “I then developed everything around that — a timeless and classic house rich with details.” The couple and Godin spent a year collaborating on the design process, with construction taking place between 2012 and 2014. Because the home faces south, with the north side looking out over the river, Godin placed floor-to-ceiling windows along the west and north sides to allow sunlight to flood through and to maximize river views. 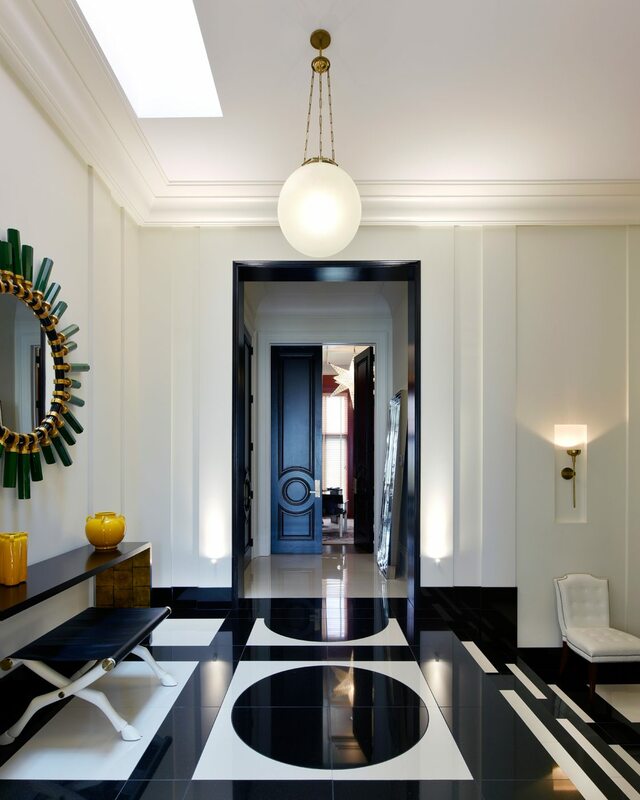 He and Valerie then set about imagining every detail for the dramatic interior, which would highlight 12-foot ceilings, elaborate mouldings, and bold colours and patterns inspired by the playful work of Kelly Wearstler, a California-based designer. 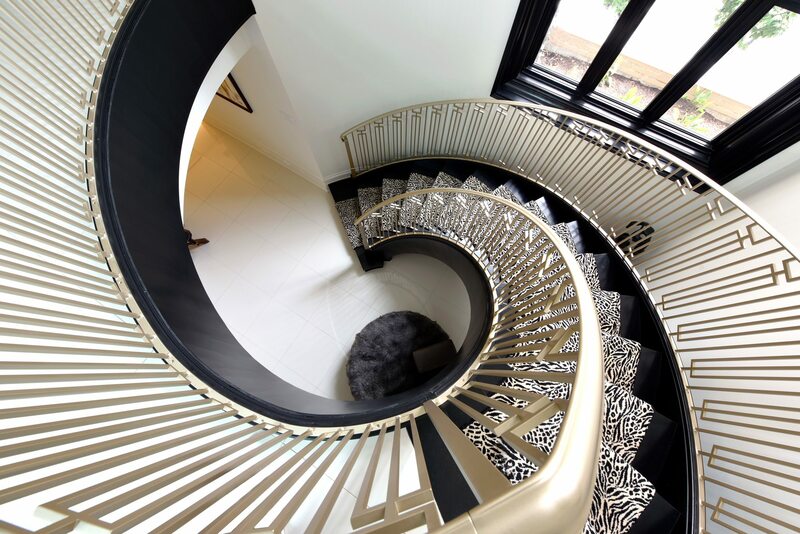 Wearstler, whose background is in interior and graphic design, has been described as a “mega decorator,” a designer whose glamorous sense of style includes a love for intense colours, bold patterns, and contrasting textures. “Valerie and I would look at pictures of her work, then modify those ideas to create the same feeling,” says Godin. 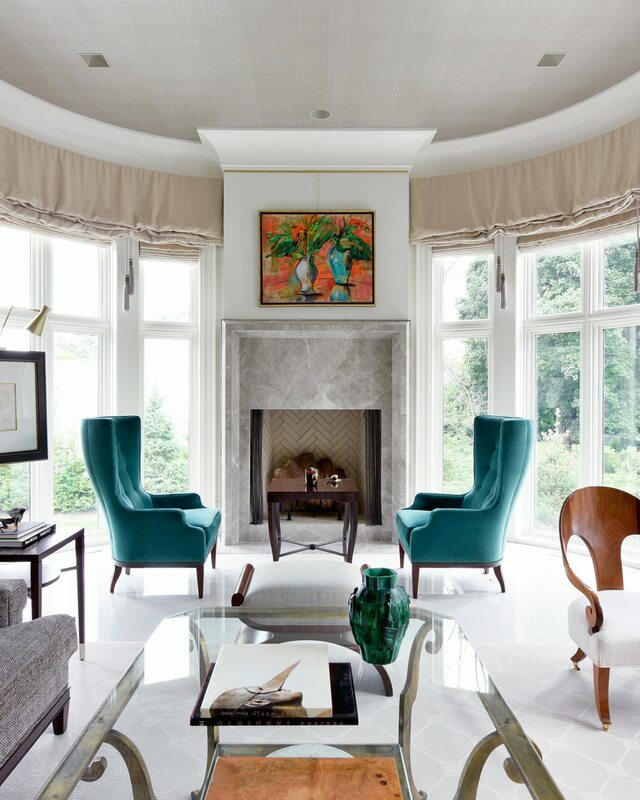 The two also studied the interiors of New York City-based designer Steven Gambrel, incorporating his appreciation for theatrical painted ceilings throughout the house. “His work makes me weak at the knees,” says Valerie with a laugh. 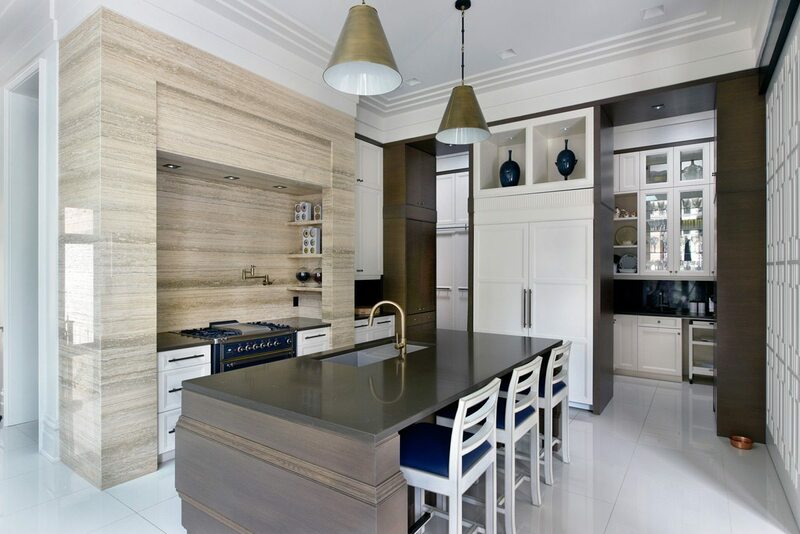 The kitchen is a cook’s delight, anchored by a marble-enclosed cooking area that mimics the feel of a hearth. Deep wood tones and brass accents impart an old-world European sensibility to the room, which includes two semi-hidden pantry spaces. Beyond the kitchen, doors open out to the patio and pool space, while inside, three stairs lead down to a sunken family room filled with comfortable couches and chairs and decorated in warm blues and browns. Here the ceilings are 14 feet and yet the room feels cozy, anchored by a marble fireplace and surrounded by rich linen drapes that, when closed, envelop the room. 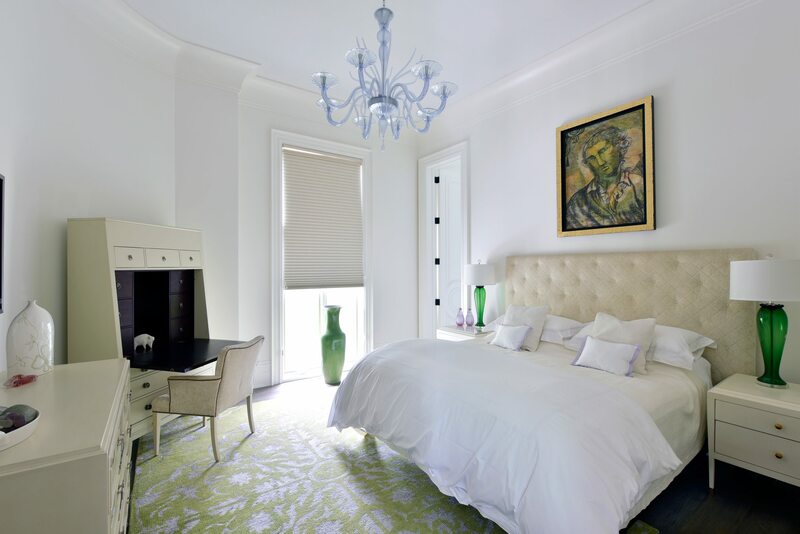 “Steven Gambrel uses big prints in big rooms, and that motivated me to try it with the drapes,” says Valerie. “I tell her the pattern looks like one of Don Cherry’s jackets,” jokes Yves. A passageway to the right of the sunken family room accesses the more intimate areas of the house, including the couple’s master bedroom suite. Because the land slopes down to the river, the room appears to float on high, a wall of windows at the far end of the room opening to a covered balcony that overlooks the river. “It’s gorgeous to be here to watch the early-morning fog — it’s ethereal,” says Yves. 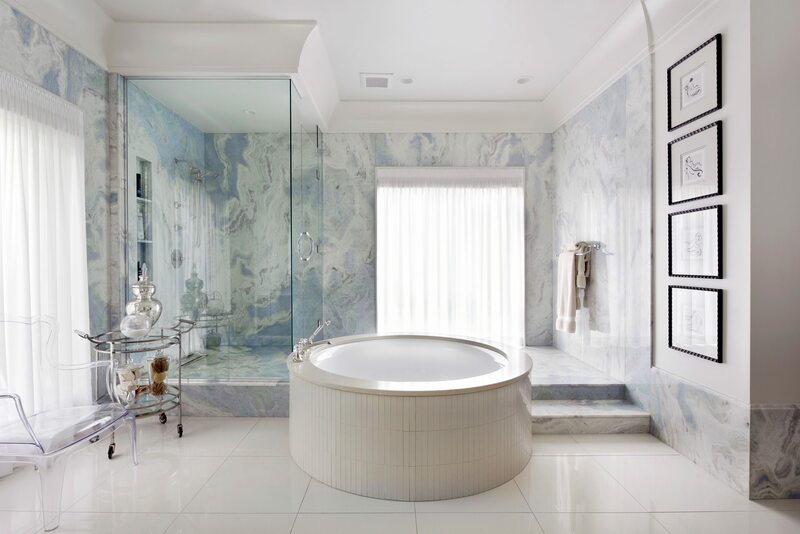 The master bathroom picks up those same cloud-like hues, a unique blue, grey, and white marble used to full effect on both the walls and the floors. It’s a truly luxurious room, the circular tub and expansive shower looking back toward matching his-and-hers vanities.